The most recent economic crisis is a standalone event (a recession, rather than a continuation of a period of longer-term stagnation) and, thus, we can talk about the so-called 'lost decade' when it comes to the crisis-induced disruption. Three really powerful articles on the topic of median incomes in the U.S. over the last 30 years that clearly dispute these points. First, Quartz.com piece, using US Census Bureau data, showing that inflation-adjusted median household income in 2014 stood at USD53,657 down 6.5% on 2007 levels and back to the levels compatible with 1989. Link to full article here. Second, Mike Shedlock's piece covering same data from more involved angles, with more scar figures: "Real median household income for all races is where it was in 1996. Real median household income for white non-Hispanics is where it was in 1997. Real median household income for blacks is where it first was in 1995. Real median household income for Hispanics is where it first was in 1998. Real median household income for Asians is where it first was in 1995." Full article here. The key point in both is that the so-called 'lost decade' looks more like 'lost two decades' and counting. Third, Yves Smith's piece on the same topic, taking adjustments to historical data into account, showing (chart below) that "Median household income for non-elderly households in 2014 ($60,462) was 9.2 percent, or $6,113, below its level in 2007. The disappointing trends of the Great Recession and its aftermath come on the heels of the weak labor market from 2000–2007, during which the median income of non-elderly households fell significantly from $68,941 to $66,575, the first time in the post-war period that incomes failed to grow over a business cycle. 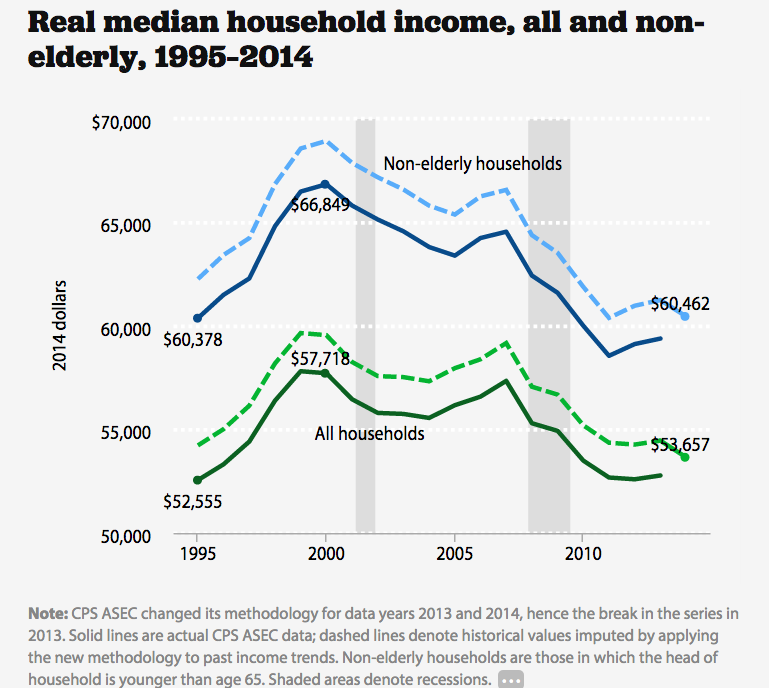 Altogether, from 2000–2014, the median income for non-elderly households fell from $68,941 to $60,462, a decline of $8,479, or 12.3 percent…" Full article here.